Unit designed for a 2,000# lifting capacity, 48” discharge height, 135° rotational arc. Unit has a 40” wide x 42” deep bucket or “skip” to accept plastic containers of metal filings. Bucket includes a fixed position hold down system to prevent excessive movement of the container during the dump cycle. Container/cart combination is manually rolled into the dumper bucket at floor level. Dump bucket will rotate through a 60” wide x 120” tall door way, and discharge into an existing 36” high dumpster. Auto/manual mode controls housed in a Hoffman NEMA 4 enclosure. Unit includes a self-contained 2 GPM hydraulic system with 460v/3ph/60Hz drive motor. Dumper unit painted MTS Safety Blue. 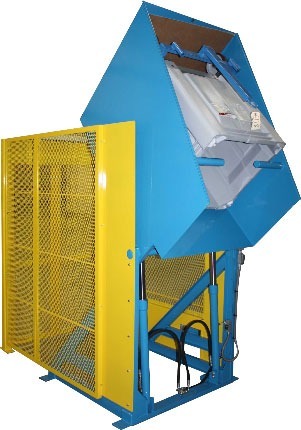 Expanded metal safety caging with twin electrically interlocked loading doors. Guarding is bolted to the dumper main frame, and painted Safety Yellow.